Now you may not use Mint. But if you’ve ever tried to parse data copied from a website, you know that it can sometimes be challenging. 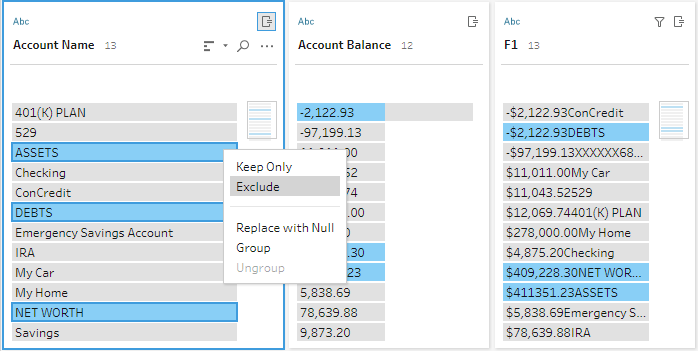 I thought I’d share this example to help spark some ideas about how unstructured data can be tackled using Tableau Prep! The data are made up, but the problems are real! So, I have my own process. 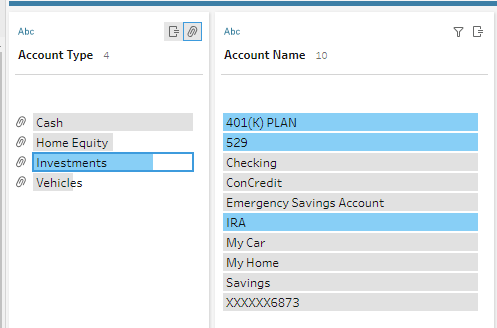 It’s a couple of manual steps, but I’ve built a rich data set with it that helps me make sure I’m on track with financial goals. 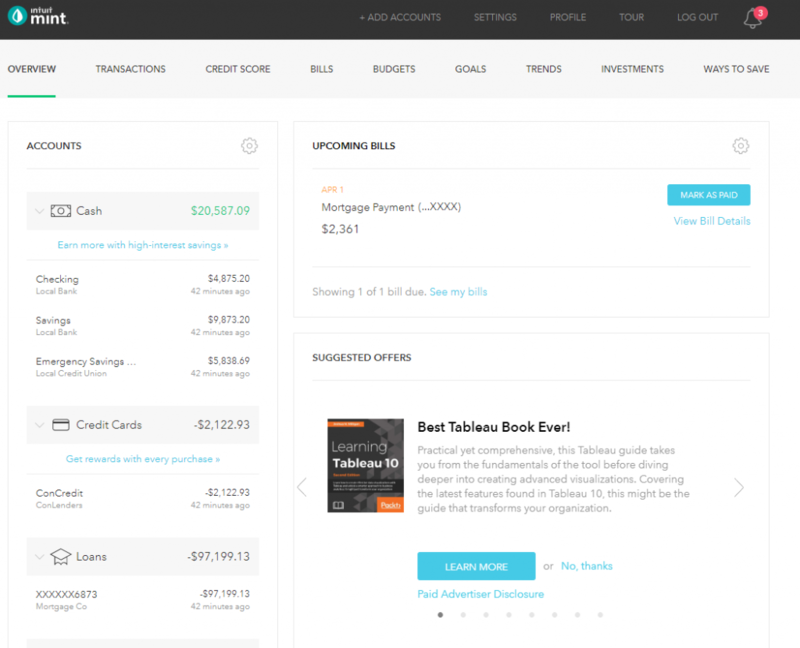 On the Overview tab of the Mint home screen press Ctrl + a to select all the text on the page. Yes, this gets menus, advertisements, copyright messages, and more. I don’t care! In Notepad (or whatever text editor you fell like), paste the text. Save the file with the date as the name. 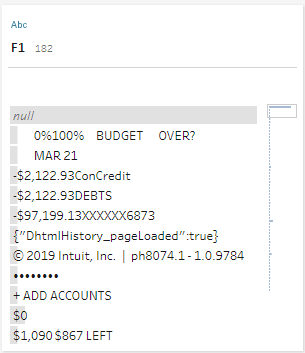 I like to use the format YYYY-MM-DD.txt as it keeps the files in order in the directory listing and is easily parsed in Tableau Prep (which we’ll see in a moment). Now I said I was exporting the account balance history. 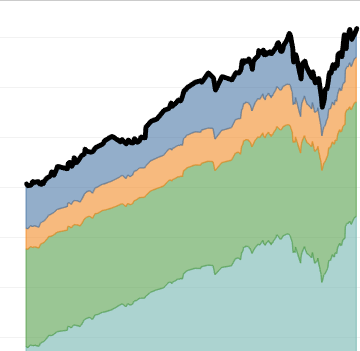 Okay, not really – it’s just the current account balances for the day. So I have to do this periodically. If I’m obsessive, I might do it daily. But if I miss a few days or weeks, it won’t really matter because I can still build up a very impressive history of account balances. 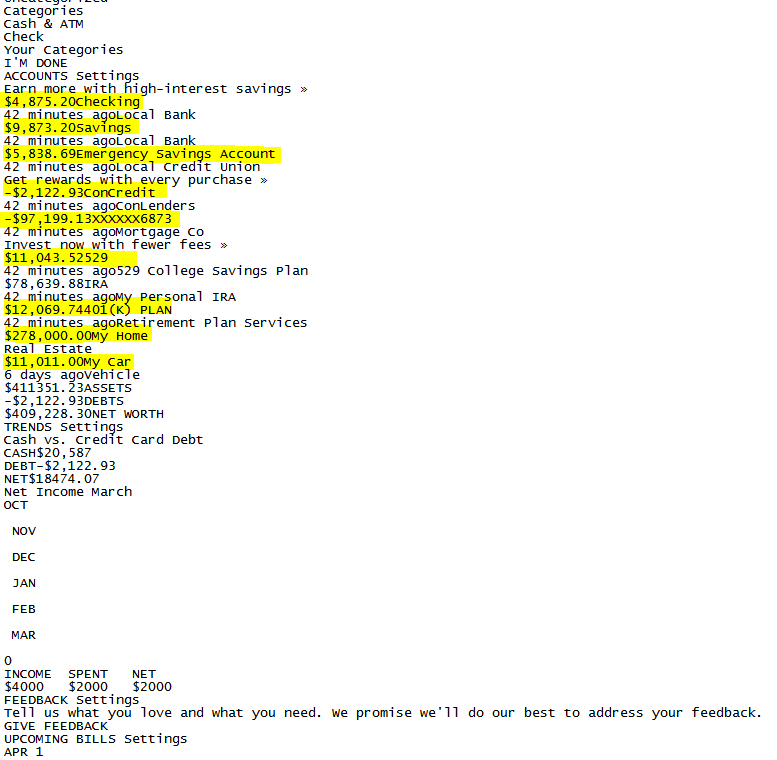 It’s got my accounts and account balances (highlighted) along with a lot of other junk. But I’m not going to worry about cleaning anything here. I’m just going to leave it as is and start collecting similar files every so often. I’ll pile them up in a directory and then unleash the power of Tableau Prep to get the data I want. All data has some structure – but this is far from the rows and columns you’d expect from a database or spreadsheet. 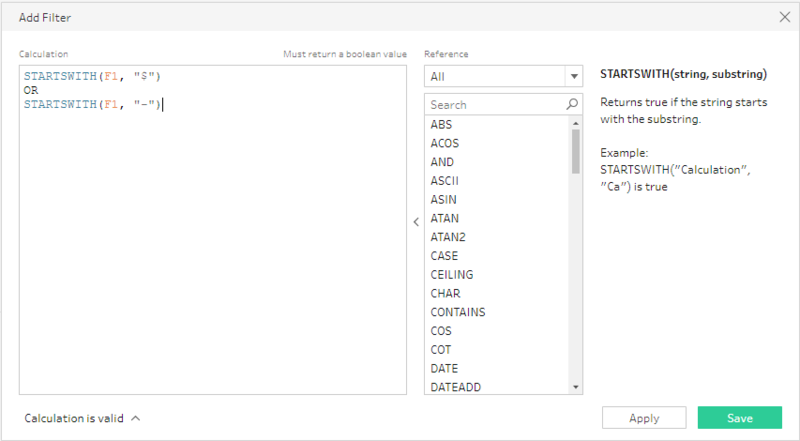 Working with this data in Tableau Prep really shows off Tableau Prep’s ability to give you a flow of thought as you tackle some unique challenges. By the way, this is a one-time setup. My goal is to design something that I don’t have to change as I collect data. I’ll start with a wild-card union to all the files so I can get the full account history from Mint snapshots. Just click the ABC to change it from a string to date and then change the name of the field. I could manually select what I want to keep or exclude. But as new data is acquired, the values will change and this manual selection won’t be valid anymore. At this point, I’ll split out the values from the remaining text. Most of that will be the account name. And where it’s not, I can filter. I’ll do this with a couple of calculated fields. In this case, we’ll start after the decimal places to pick up the account name (hence the + 3 as the starting position with no ending position specified). Not only are they excluded, they won’t ever show up again. 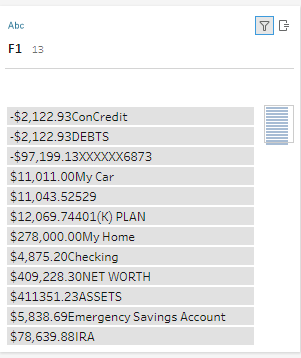 If I’d excluded them from field F1, then the next snapshot would have different values (hopefully Debts is going down and Assets is going up!) and the filter wouldn’t be set for those specific values. But now ASSETS, DEBTS, and NET WORTH will always be gone from the data set no matter what balance they have. Finally, I’ll extend the data set a bit more by grouping the account names into account types. 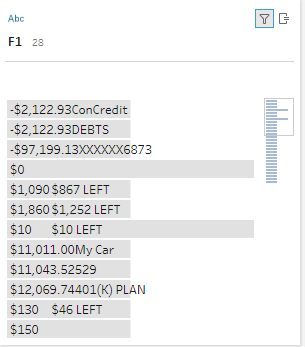 And with that, I have a nice data set containing my account history from Mint and can start exploring in Tableau!